Olga Bobrova: I spoke to many people, including those from YABLOKO, after the [Moscow mayoral] election. And many had the impression that what had happened was just a ‘terrible horror’. What do you think? Grigory Yavlinsky: And what is this ‘terrible horror’? And for whom? Now the collapse of the society has reached such a scope that it is not possible to guess right away what you mean. For some people it is horrible that there is no second round [between pro-Kremlin’s ex Mayor Sergei Sobyanin and blogger Alexei Navalny in the Moscow mayoral election]. For other it is horrible that Alexei has obtained 600,000 votes. The third category finds it horrible that Sobyanin has barely managed to retain his post of the city Mayor. And 70 per cent of Muscovites generally believe that such an election is dirty stuff and horror, and now every man is for himself and saves as he can. Olga Bobrova: But quite reasonable people vote for him. The people who could have supported YABLOKO – young, rich and successful. The second part are those who listened to and read the media participating in his campaign, and these media were trying to persuade them that a high percentage of votes cast for Navalny was allegedly to make it hot for Vladimir Putin, and also would “create institutions” and what is more would “save this guy from imprisonment”. That’s it. They are different people as of their social status. And his campaign was carried out in the same [aggressive] manner like the [perished] SPS party [the Union of Right-Wing Forces] conducted its campaign long ago, only with an adjustment to more advanced modern technologies. It was like a rock star promotion. Generally speaking, in modern Moscow there are many people with high self-esteem and very low self-realisation, who anxiously do not understand their future… The present Russian system produces such people on a mass scale, and they are perhaps a considerable part of those who voted for the person who “loves them”. Olga Bobrova: And yet, such a success of Alexei Navalny – is it good or bad? Grigory Yavlinsky: If the people vote for something they do not know and nobody knows why and without any hesitation what will happen simply for the sake of protest – is it good or bad? This will certainly bring us no good. His result represents full mobilization of all he can gather in such circumstances. Maybe if the election was in November, when it rains, then the result would be a little higher, there would be more of an SPS-oligarchic flavour combined with nationalist slogans, but maybe by that time people would have got a bit tired of him and frustration would came in response to his aggressive campaign, but he could not conduct any other campaign as there is lack of content… One thing is clear: in November much more people would have voted for Sergei Mitrokhin. Olga Bobrova: – But why today people who are ready to vote for YABLOKO are not mobilized to such an extent as Alexei Navalny’s electorate? Grigory Yavlinsky: Not so many YABLOKO voters came to the polls. First, they do not believe in the election procedure. Second, they did not like the alternative “[pro-Putin’s] Sergei Sobyanin or Alexei Navalny” which was rudely imposed on them by the politically engaged mass media: “Vote or You will Lose” exactly like “Yeltsin or Zyuganov” (Ed. An allusion to the aggressive Boris Yeltsin’s campaigning with such slogans at the presidential elections of 1996 which pretended to neglect all other candidates scaring voters with an allegedly coming recoil to communism). Third, they loathed to follow the hysteria “vote, villains, or else he will be put in jail”! But it was critical that due to a terrible noise made by the media and continuous provocations it was impossible to hear Sergei Mitrokhin with his calm, intelligent and professional programme. Olga Bobrova: Do you mean that all Navalny’s votes were obtained as a result of technologies? Olga Bobrova: But what prevents YABLOKO from the use of modern political technologies? Grigory Yavlinsky: We are the party of the change and constructive professional programmes, principles, respect for the individual and his rights. For us technologies like “Vote or He Will Be Jailed” is unacceptable. And also Mitrokhin was neither jailed nor released from prison this summer. Olga Bobrova: And now regardless of Mitrokhin, let us look at the election campaigns of the recent years. In 1990s my parents could stake on YABLOKO as a real political force, for them it was even a practical decision: “I want these people to rule the country”. And now it is like expressing one’s stance only. And I can wish as much as I can, but I know that finally YABLOKO will get only three and two decimal places right of the vote. Grigory Yavlinsky: To have the courage to express one’s free position in a semi-fascist atmosphere is a serious thing. Certainly, it is different time now, but let us recollect that once such people as people Sergei Kovalev and Andrei Sakharov non-violently broke the totalitarian communist system by peacefully expressing their position and offering sensible alternatives. Do not forget that. The political regime and oligarchic groups that split from it but are absolutely its “kindred spirits” have been fighting against YABLOKO for nearly twenty years already. Both want to completely oust us from the power and politics. All of them absolutely correctly consider YABLOKO an anti-system alternative – and they remove us from elections, roughly falsify votings, say lies, fling mud at us on the radio and Internet, steal our ideas and programmes that are foreign to them [ideologically]. In their fighting they now and then inflate “political stars”, which they put out later, but we go on working. They are fighting for their power and their security. However, where YABLOKO obtains mandates in spite of everything, the whole political atmosphere seriously changes. Olga Bobrova: But I am not satisfied with such an explanation. Grigory Yavlinsky: And it is good that you are not satisfied with it, hence, it is necessary to work. We need to create a large, serious, politically responsible and financially transparent democratic opposition. But as everything is very scattered, people are taught to rely on a leader or a fight, but not to work on the creation of political institutions, all this does not move any further than conversations over coffee. And the life of those who discuss all this in Moscow is usually well-off, and they are satisfied with it in general. I can tell you about the practical things that have to be done now, but it will not be easy. It is high time to behave intelligibly. It is high time to stop being postmodernists – being a little for democrats and a bit for “liberal fascists”, and a little for the nationalists, and a tiny bit for the “good” oligarchs, and for the left and for the trendy, and most importantly for themselves, the beloved ones. We have to get the courage and stop being afraid of “one’s own environment”. After all, we have the following the lesson of what has happened: very few people are afraid of Putin in Moscow now, but almost everyone is afraid of his own in-crowd… It’s time to gather courage and tell to the “glamorous ruler of the minds” that they are profanes and amateurs in politics. We should analyze the past 25 years: who have been doing what, which party have been expressing your interests and the interests of your readers more than other, who have never deceived you and have never stolen anything from the country, who have been doing their best to advocate for human rights and dignity and who have been spitting on people’s lives, and who from politicians have good reputation and who bad …, we have to act! You have to finally determine your stand – what you are standing for and for whom you are! Do not hesitate to write about them and spread your views common with theirs, distribute them to the common views. Ask questions if necessary, make influence realising that this is our common cause… and to fight for this. Every day, in every issue and every political article. If you show white feather posing as “independent” journalists and turn everything into a cynical farce – then we will get Fascism in full. Once, about three years ago, I spoke about all this to a group of journalists on the eve of the past presidential election. They thought a little and then said that it was too much for them, as each of them had his own life. Well, that’s how we lost it all. Now it is high time to begin. If there is just one such newspaper, maybe another will join it. At least someone has to begin it. And if nothing of the kind happens, then there will be no victory. Because a victory with the permission of the bosses is not your victory, it is theirs. Speaking about the Moscow City Duma [election coming in 2014], it is necessary to start serious work on it already tomorrow. Everyone should work. It will be very hard work. As you have to convince people to come to the polling stations at the Moscow City Duma elections, when there are only several dozen deputies who have virtually no rights – all this for a 12-million city. And who is interested in this? We will have to explain that we need an able opposition – and then it will be a real struggle for power. Just imagine what it could have been, if Sobyanin had 49 per cent of the vote [at the recent mayoral election], and Mitrokhin came second! You would have breathed differently in Moscow now, rather than observed shrieks or rock festival, it would have been a real change! Olga Bobrova: There is a point of view that in the second round [of the Moscow mayoral election] Alexei Navalny could have got less vote than he received in the first round. And it would have been his obvious defeat. Grigory Yavlinsky: Most likely all this would have been as you say, and by the way if Mitrokhin got in the second round even being from far behind from [the acting Mayor] Sergei Sobyanin, there would have been a big chance for Mitrokhin to fight for the victory [in the second round]. Olga Bobrova: Then why the authorities did not allow for the second round? Maybe they do not want to allow for Alexei Navalny’s defeat? Grigory Yavlinsky: The authorities believe that the second round is a sign of weakness. Olga Bobrova: But now it’s also a way to trample Navalny. Grigory Yavlinsky: Well, it can always be done in a different way. We do not know what the authorities want from him now. If they decide that it is “useful” to continue his promotion as a public leader who can replace Vladimir Zhirinovsky [LDPR leader] and Sergei Mironov [Just Russia leader], this will mean that we are facing very tough times in the country, much harder than it was before. But Alexei Navalny did not come out of nowhere. In the beginning, after YABLOKO parted with him, he tried to do something independently: the Narod (People) movement (Ed. Which has been widely considered nationalistic), working with Governor Belykh [in the Kirov region], but then Alfa Group approached him, gave him his managers, began developing projects for him, financing him, determining the key lines for his activities, introducing him to influential persons and organisations and establishing his international contacts, and quickly they turned him into what he is now. This is well known. If you look through the articles published on the internet, which no one has ever denied, you will easily see it all. Such things – purposeful creation and promotion of political figures representing the interests of the group – are common practices of large oligarchic corporations. There have been so many such examples. They did this once with [General Alexander] Lebed (Ed. General Lebed was Boris Yeltsin’s competitor at the presidential elections of 1996), when they needed Lebed to help them in the presidential elections of 1996. Olga Bobrova: Don’t you think these are conspiracy theories? Even if Navalny is the project, nevertheless, the man took his place in the history of Russia, and they will write about him in the textbooks. 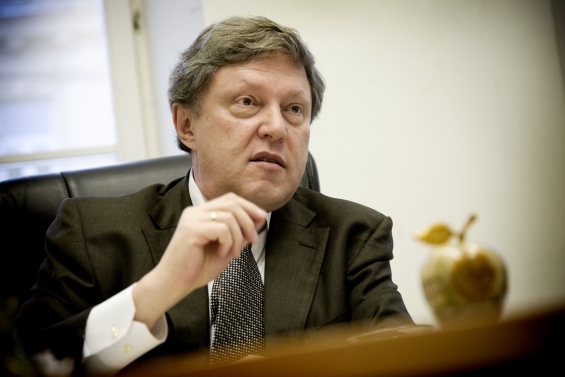 Grigory Yavlinsky: Whether he will enter history and with what mark – positive or negative – time will show that. Yet there has been nothing to speak about. Olga Bobrova: And don’t you regret that Navalny left you party? Maybe something different could have come out of him if he had good teachers? Grigory Yavlinsky: When fundamental differences emerge and someone leaves, it is always a pity. He is a man of very different views not and a different attitude to life compared to YABLOKO. He had been in the party for a long time and we knew him well. But it happened long time ago. And now when asked “would you like to make an agreement?” – but how? Olga Bobrova: I think that there was a moment when you did not have even negotiate with him. Grigory Yavlinsky: But in what capacity we had to negotiate with him and for what? He has different views and he does not give them up. Olga Bobrova: He could have been useful at least as a public relations specialist. Grigory Yavlinsky: Well, come on, what PR specialist he is… What is happening now is not done by him, this unprecedented publicity and his public image was made for him byskillful PR and glamour specialists for a good reward. Olga Bobrova: And does he have any good potential as a politician? Grigory Yavlinsky: Well, he is capable, we know that. But it is quite another thing how he uses his abilities. In general, he is probably a good person. They say he has a beautiful wife and children, God give him and his whole family’s health and nice normal family life. In our party he was simply an ordinary person. Sometimes, though, he called girls all sorts of names, like they were “black” and he was “white”. In general, his life will be extremely difficult, he has got in a serious trouble and the intersection of different interests, but Alexei Navlany’s future still depends on him. Russian politics implies that sometimes one has to come in contact with oligarchic structures, as you know I had contacts with Vladimir Gusinsky (Ed. Ex media magnate) and Mikhail Khodorkovsky. But every time you have to answer a question: and what are you on your own? You know what a collision did I have in 1999? They stopped financing me right in the middle of my election campaign. Because I opposed the second war in Chechnya and did not support Vladimir Putin. But I stood my ground. We are probably the only party in the world which was fighting against was in the situation of “patriotic” fervor – and we got six per cent of the vote, although we were approaching 20 per cent on the eve of the elections. Many accused me in the party then in the failure in the elections, because they planned to become MPs. Here is the answer to your question, whether I regret about Navalny. We do not swap principles for votes. Olga Bobrova: According to your theory, do you think that the alliance between the Kremlin and Navalny can be drawn as something obvious? Olga Bobrova: But perhaps it is the same story as the question asked at Seliger whether Navalny is the Kremlin’s project. Grigory Yavlinsky: Maybe he was not the Kremlin’s project, but by the logic of the situation, the Kremlin may be willing to purchase such a project. Not necessarily they should get all at once. Olga Bobrova: Now the most important thing: I would like to understand what will happen next? Grigory Yavlinsky: If Putin together with Alfa Group go on with this project, this will be a large which several more years will be simulating the opposition. Or maybe Putin will fight against him (or rather with Alfa Group), and then the situation will be more complicated. But maybe no one will engaged with him now, because he lost the election – and then all will subside by itself. .
Olga Bobrova: All of the variants you have mentioned now are equally pessimistic. Grigory Yavlinsky: You see, for so many years, since 1992, Russian politics have been degrading. You all know it very well. [It was] degradation, which included the destruction of personality in politics. That is why it is not surprising that all has developed in such a way. You see, a politician can not accomplish everything by himself. He can only say or express what people want. He is not a magician. If you are walking a little ahead, this means that someone is following you. But if no one is going by your side, then you are not walking ahead of all, you are simply walking alone. Olga Bobrova: Let’s say that we are following you. Grigory Yavlinsky: Thank you, but it is not enough now – everyone must work. Fascism is no joke. Without a direct, extremely active and responsible participation of all of you, we will have three per cent only, and they will go on with their attacks. This is like a serious disease – at first it is very difficult to diagnose it, and when everyone sees it, it is already too late to cure it. Posted: September 20th, 2013 under Moscow Mayoral Elections 2013, Yabloko's Views.